We take for gran­ted a clean, safe water supply. Infected and pol­luted water can kill. 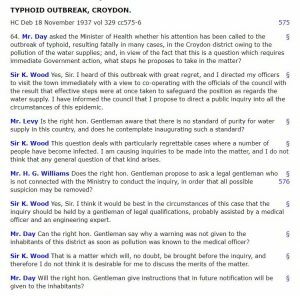 This was the crux of the account of the typhoid epi­demic in Croydon, the out­break first recor­ded on 27th October 1937 res­ult­ing in 43 deaths and 341 con­tract­ing the bac­teria. Symptoms include extreme lucid­ity, delu­sion, intense fever, loss of appet­ite, insom­nia and a rose pink rash with spots. Positive proof of the origin of the out­break was not given, but the con­clu­sion was that it was caused by pol­luted water from a chalk well in Addington, a suburb of Croydon, from which water was sup­plied to between 36,000 and 40,000 inhab­it­ants. The well, 10 feet in dia­meter and 250 feet deep, was built in 1888. Essential main­ten­ance work was needed on the pumps, fil­ters and brick­work. From the begin­ning of the work until 15th October the water was pumped to waste but there­after, until 3rd November, it was pumped to supply. The repairs were car­ried out by 18 volun­teers who were sewer work­ers with no exper­i­ence of water supply. The men were lowered into the well on a plat­form which also served to trans­port tools, mater­i­als and rubble. To cater for their ‘calls of nature’ a bucket was lowered and raised to the sur­face on the plat­form for urine dis­posal and they were instruc­ted to come to the sur­face for ‘bowel move­ments.’ Clearly, the men were trus­ted to obey these simple instruc­tions. Subsequently, it was dis­covered that one of the work­ers was a car­rier of the typhoid bac­teria. At the top level enquiry led by Mr H.L. Murphy, all work­ers stated on oath that they fol­lowed the cor­rect pro­ced­ures for dis­pos­ing of urine and faeces, and did not pol­lute the water supply. Filters and chlor­in­at­ors play a major role in the puri­fic­a­tion of water. The fil­ters, eight feet in dia­meter, were removed for clean­ing and main­ten­ance, with the unin­ten­ded con­sequence that the chlor­in­at­ors did not func­tion. The water supply was neither filtered nor chlor­in­ated. The enquiry under Mr Murphy looked at the roles of senior man­age­ment and in par­tic­u­lar the Borough Engineer and the Medical Officer for Health for Croydon. It found that the remit of the Borough Engineer was too wide for one person and respons­ib­il­ity for water was only one of his many import­ant duties. The Medical Officer believed food was more of a health hazard than water. It appeared that these two officers had little or no con­tact or com­mu­nic­a­tion with each other. It was no wonder the water supply was neg­lected, res­ult­ing in no pro­ced­ures or doc­u­ment­a­tion for water samples, chlor­in­a­tion and the gen­eral qual­ity of the water supply. The enquiry con­cluded that the infec­tion was caused by a com­bin­a­tion of factors coming together, namely that the well was under repair, that one of the work­ers was a typhoid car­rier and that the supply water was not chlor­in­ated. Management was implic­ated and cri­ti­cised for not suf­fi­ciently man­aging the water supply and for not having adequate com­mu­nic­a­tions and backup pro­ced­ures and records. This was a major turn­ing point in the gov­ernance of the water industry, with the intro­duc­tion of codes of prac­tice res­ult­ing from a High Court case. Croydon was a major incid­ent in the water industry with fatal­it­ies prov­ing to be a form­at­ive event in making the public and author­it­ies aware of the crit­ical import­ance of a clean and safe water supply. It was a most inter­est­ing talk which promp­ted many ques­tions from our mem­bers.